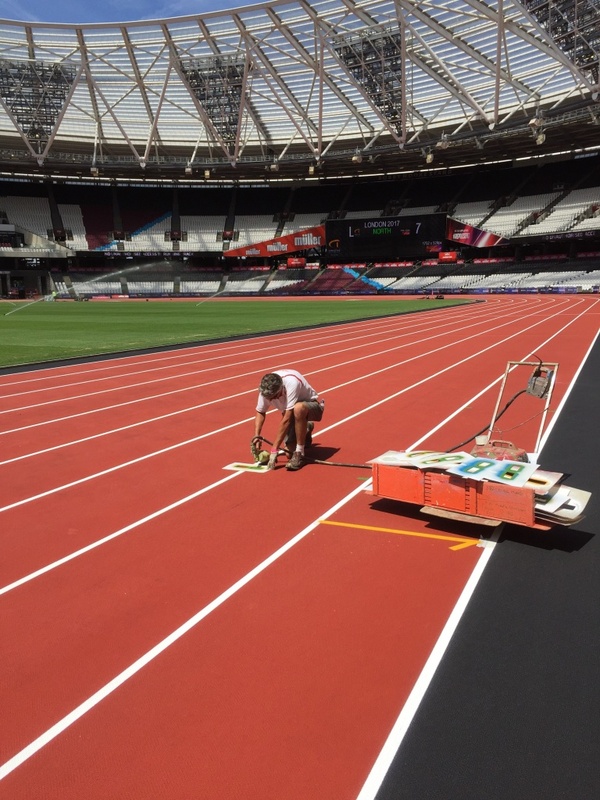 Over the last few weeks, White Line Services have been preparing the Queen Elizabeth Stadium for the biggest sporting event since London 2012. Last held in Beijing in 2015, this year London is home to the IAAF World Championships, the track has undergone track washing, repairs, and full remarking of all lines and events. The IAAF World Championships will last 10 magical days, where the world’s top athletes will race to glory including Mo Farah, who wants to finish his track career in style by winning gold as well as Usain Bolt, who’s hopeful to set an “unbreakable” world record ahead of this retirement. Read about what happened when we washed the Queen Elizabeth track in June, a job which involved two teams working around the clock using various specialist machines to clean the track. Phase two took place in July and involved rewashing the track, carrying out repairs and line marking. This time 3 teams worked side by side washing the track and remarking all lines and events. This entry was posted in blog and tagged Athletics, IAAF World Championship, London 2017 on August 2, 2017 by Marc Adams. White Line Services International Ltd. Home Farm, Hammerwood West Sussex RH19 3QE United Kingdom telephone: +44 (0)1342 851172 e-mail: info@white-line-services.com Copyright © 2015 White Line Services International Ltd.